Action OHS Consulting has recently established a FREE 4-monthly newsletters available to our clients, along with our friends. 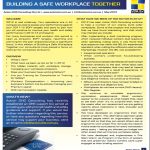 In the May 2012 edition of Building a Safe Workplace Together we have placed a focus on management of workplace stressors. We have provided an overview of “good stress” vs “bad stress” and covered recent research involving fatigue management and working fathers. In addition we have provided you with some helpful tips to reduce your workers compensation claims premium. To keep up to date, with health and safety news as it happens please “Like us” on Facebook or “Follow us” on Twitter. If you would like to be placed on our future mailing list contact us.